Warm up with a sizzling offer this Winter!! ? Get 20% OFF the price of any #ScorchBerserker exhaust pipe when getting a quote before 31 August 2018. 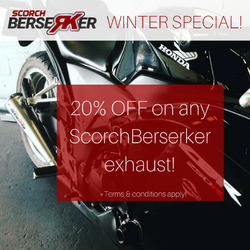 ▪️The 20% discount is not applicable to the installation cost, but only on the purchase of any ScorchBerserker exhaust pipe. ▪️Purchase and installation of any ScorchBerserker exhaust must be at the ScorchBerserker Workshop, Brackenfell in the Western Cape. ▪️The owners of ScorchBerserker, Brackenfell reserves the rights to terminate this promotional offer at any stage without prior notice.